You use your bathroom at all times of the day, and the lighting in the space should be functional and flexible to accommodate a variety of tasks. You take a shower each morning, you shave or put on makeup in front of the mirror, and you enjoy a nice long soak in the tub at the end of a long day. With the right bathroom lighting, you can use each area to its fullest extent, and the ambiance of the room will be perfect, no matter what time of day it may be. At Lighting One, our co-op member showrooms can help you find the best options for your home, and you can finally create the bathroom that you’ve always wanted! If you’ve ever visited a lighting showroom, you may have been overwhelmed by the number of fixtures hanging on the wall and from the ceiling. The store may have been set up by room so that you could see what a certain lamp looked like in a modern living room, or how a chandelier is meant to be installed in an entryway. When it comes to bathrooms, contemporary showrooms do an outstanding job of setting up fixtures to show how they add to both the functionality and the comfort of a space. You can find this setup at many Lighting One showrooms, and the staff can help you find suitable options that fit both your budget and your vision of what you want your bathroom to be. Another perk of shopping with a Lighting One showroom is that you have access to a greater number of name-brand options. With products from Kichler, Quoizel, and many other leading manufacturers, you’ll know that you’re getting the very best quality for the very best price, and that your bathroom fixtures are going to last for many, many years. On top of quality suppliers and products, several of our co-op members have in-house design teams that know the ins and outs of bathroom construction and remodeling, and they can help you choose everything from the vanity lights to the floor tile. If you’re building a new home we know you have grand plans for the master bath, and they can assist you with product selection and installation so that you can create your dream master bath while keeping your project on schedule and budget. Many homeowners, when shopping for new bathroom lighting, begin their search online . While this is a great way to gather research and begin viewing options, there is something to be said about going into a showroom, speaking face-to-face with a lighting professional, and seeing the lights selection for yourself. Keep in mind is that every Lighting One showroom is locally owned and operated by lighting experts who live in your community. Many have gained experience dealing with lighting replacements in their own home or through assisting the the thousands of homeowners that pass through their showroom with lighting projects just like yours each year. When you need bathroom lighting design and installation, let Lighting One show you the way to amazing products at great prices. We have more than 300 showrooms across North America, so no matter where you are, you’ll most likely be able to find a showroom near you. Check out our locations today! The staff at each store is always happy to help. Find your new bathroom lighting today! When building a new home each room requires lots of attention to detail, and you want each space to turn out exactly how you envision it. When it comes to the bathrooms, many modern designers like to take risks in terms of the layout, the materials, and the lighting. Gone are the days of the simple utilitarian bathroom – today, these spaces are relaxing, spa-like rooms that have every amenity imaginable. At Lighting One, we love helping those who are building a new home find the perfect bathroom lights at a local showroom. Once your new house is framed, you can begin choosing light fixtures for every room. The contractor will begin installing wiring and plumbing, and both of those things are obviously very important for your bathrooms. Your floor plan will determine many of your lighting needs and our showrooms experts can help you choose the right lighting for every room of your new home. Whether you have a powder room off the front entryway, a guest bath attached to the first-floor guestroom, a master bath with the master bedroom on the second floor, the list and your choices are endless. Even if lighting installation is still months away, it’s never too early to begin choosing your bathroom fixtures. 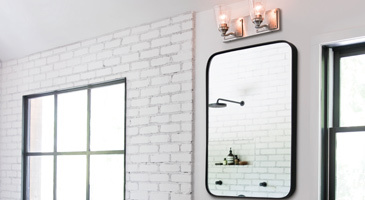 You may spot a vanity light in a Lighting One showroom that you absolutely love, and that can inform your decision when it comes to choosing the wall sconces that will be placed on either side of the bathroom mirror. It can also influence the type of decor that you choose for a particular bathroom, such as a nautical theme for the guest bath, or a certain color that you add as an accent in the master bath. 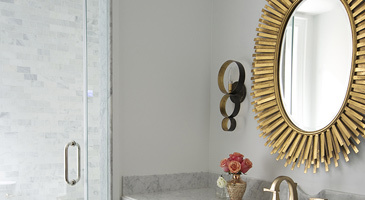 The ambient (or general) fixture in your bathroom should serve as a focal point, and that’s why so many designers are now encouraging homeowners to think about mini chandeliers and other unique fixtures for the space. Whereas homes used to have one central light fixture in the bathroom that likely had a glass globe or shade on it, you now see chandeliers and other hanging lights that reflect that spa-like atmosphere that so many people prefer. Your bathroom is where you relax and pamper yourself, so why shouldn’t you have elegant and sophisticated lighting? Your bathroom is also where you get ready for work in the morning and ready for bed at night, so you need lighting that’s bright enough for personal tasks such as shaving, brushing your teeth, and putting on makeup. The standard approach is to have a vanity light above the mirror, but even with multiple bulbs, this fixture can cause issues. Light that comes directly from above can create dark lines and shadows on your face, which aren’t conducive to shaving or putting on makeup. This is where sconces on either side of the mirror come in, since they provide lighting from a different angle, helping you see better as you groom yourself. For accent lighting, it’s important to think about how you will use the space on a regular basis. Are the shower and bathtub separate? Do you need recessed lights above the bathing area? If the tub is set into an alcove that has a tall ceiling, think about adding a single pendant light that adds a touch of class to the space. Your accent lights are there to do just that – accentuate the design and architectural features of the bathroom so that you can fully appreciate them every time you’re there. Another important aspect of every new home project is choosing the right lighting controls. 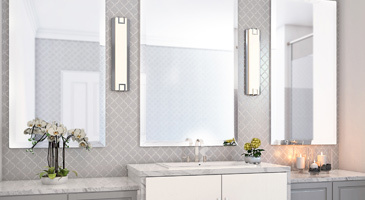 Standard toggle switches are fine for many applications, but Lighting One showrooms can assist you in finding dimmer switches and sensor panels that will enhance your bathroom lighting experience. Take a moment to think about how important it is to be able to see when you get up in the middle of the night to use the bathroom. Wouldn’t it be great if the lights automatically turned on at a low level so that you’re still able to see, but you’re not blinded at three in the morning? With the selection of lighting controls at our member showrooms, you can find everything you need. If you’re building a new home and you’re ready to choose your new bathroom light fixtures, find a Lighting One showroom near you for the an amazing selection and expert guidance. Every location is equipped exclusive products from leading brands, we know that you won’t be disappointed with your experience. You may not be building a new house, but you may have plans to remodel parts of your home to bring them up to modern standards, or perhaps increase the property’s resale value. Focusing on spaces that are vital to everyday life in a home, such as the bathrooms, can greatly improve your home’s appeal and functionality. At Lighting One, we love hearing stories from our member showrooms about how a homeowner found the perfect bathroom lighting options. If you’re remodeling your master bath, a guest bath, or a powder room, visit one of our locations today! When you move into a home that had a previous owner, you often have to contend with their choice of style and decor. You will have to live with their design choices until you can get around to changing things, but the bathroom is often an easy place to start. It’s usually one of the smaller spaces in the house, so that means less time painting, tiling, or putting up new lights. When it comes to lighting styles, there are a number of options from which to choose. At Lighting One showrooms, you can find an amazing variety that ranges from Rustic to Victorian to Contemporary fixtures. Chances are the previous owner’s lighting style doesn’t match yours, and if you’re ready to update your bathroom, the lights are a great place to start. One problem that many people run into when they move into a house is that there isn’t enough light in the bathroom. On top of being outdated, the fixtures don’t provide enough illumination, and while you can often find LED and CFL bulbs with a higher lumen output, it’s often better to add more lights to the space. The prime example is the single vanity light above the mirror. New wall sconces not only add more light, they can also enhance the space. Another addition to think about is adding more lighting above the shower and tub area. Many older bathrooms rely on one central light fixture to provide illumination for the entire space. This can cause the shower or bathtub to be very dark, and while that may be okay for certain times of day, it’s not conducive to how you use your bathroom. Recessed lights can be a great option above the tub or shower stall, and they can be the perfect complement to any style, so it doesn’t matter if you replace the central fixture with a mini chandelier or another modern fixture. If you’ve been thinking about remodeling a bathroom in your home, let a Lighting One member showroom provide you with the products and expertise that you need. We have showrooms all across North America, and each store is locally owned and operated! Starting any construction or remodeling project can be overwhelming, but with the right help, you can accomplish your goals and have the home you’ve always wanted. At Lighting One, we understand how important it is for you to have the perfect bathroom lighting, no matter if it’s in your powder room or your master suite. You’ve found the double vanity you want and you’ve had the new shower surround installed, but what about the lighting? Your bathroom lights should highlight and accentuate the new design features that you’ve added, while also providing the illumination you need when you’re getting ready in front of the mirror or unwinding in the bathtub. By visiting one of our member showrooms, you’ll have the advantage of working with an amazing staff who lives where you do, and who can help you find fixtures from the nation’s leading lighting brands. They can also provide design assistance when it comes to choosing a style that fits your personality and your budget. Many of our co-op showrooms offer in-home lighting consultations, which means they will come to your house, take a look at your bathroom, and provide their expert opinion on the many directions you could go. Your new bathroom lighting awaits at a Lighting One location near you. With showrooms in nearly every state and four Canadian provinces, the fixtures that you want are never far away. If you’re looking for ideas for your new bathroom, take a look at our Inspiration Gallery. We know that you’ll see something that speaks to you and that may also serve as the inspiration you need to get started on your lighting project. If you see a specific fixture that you simply must have for your home, be sure to mention it to your local showroom staff, and they’ll do everything in their power to find it for you. 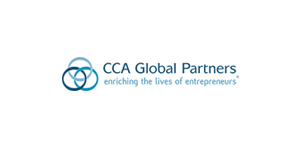 Lighting One’s co-op program exists to provide showroom owners with the products and resources they need to succeed. This allows them to help customers in their town or city find the perfect fixtures for any project, no matter if it’s a bathroom, a kitchen, or a bedroom. Each showroom has a unique collection that contains the options you want, and with access to name-brand options, you’ll always know that you’re looking at quality fixtures that will stand the test of time. Discover new bathroom lighting today!